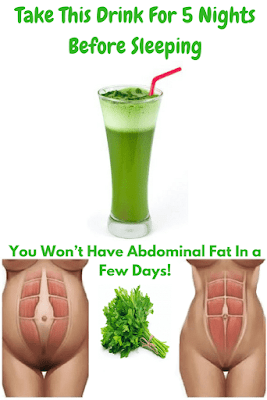 ZangleZowa: Take This Drink For 5 Nights Before Sleeping and You Won’t Have Abdominal Fat In a Few Days! 1.) Begin in a full plank position, with your palms under your shoulders, feet together. 2.) Bend your left knee under you and across towards the inside of your right elbow (your hips should turn to the right and you’ll pivot slightly on the ball of your right foot). Slide your left leg back to the start position and then repeat to the right. That’s one rep. Perform 20 reps. 1.) Lie face-up with your knees bent at a 90 degree angle, feet off of the floor, with your knees pressed together. Place your hands underneath your hips, palms facing down. 2.) Inhale, straighten your legs (toes pointing to the ceiling), and lift your hips up off the ground. Exhale and return your hips back down to the start. That’s one rep. Perform 30 reps.